I took advantage of the relative quiet over the last two weeks of holiday to finish pre-press edits for the North American edition of Unlocking the Bible by David Pawson. It’s a massive book. The original one volume edition from the UK is 1343 pages. We changed the format for this edition; making the book a little taller (9″) and wider (6″) and thinner (1111 pages). It’s easier to read and easier to handle. Personally, I think it’s prettier; but that’s just publisher talk, everybody knows it’s what’s inside that counts. And what’s inside is awesome. David Pawson has been teaching the Bible for more than fifty years, including a stint as a Royal Air Force chaplain responsible for the spiritual welfare of her majesty’s troops in the Middle East. He has traveled and preached around the world and has written more books than I can keep track of. I know – we’re publishing fourteen of them. Over the years that series of talks became Unlocking the Bible; the most relevant, down to earth, biblically honest book-by-book exposition and explanation of scripture I’ve ever experienced. I’m not just blowing smoke. A lot of others share my opinion. I received a letter over the holidays; David Pawson forwarded it to me from England. The letter was addressed to David but he wanted to share it with me because of the work we are doing bringing his books to North America. The letter was from Chris, a lead economist for the World Bank based in Washington DC. Yup, that World Bank. I was encouraged that at least one of the World Bank’s lead economists is a Christian and tickled that he, like me, was a David Pawson fan. Psalms 120-134 are called the ‘songs of ascent’, meaning ‘songs of going up’. Jerusalem is, of course, right up at the top of the hills (actually, it is in a little hollow at the top), so all the pilgrims had to go up to Jerusalem. Psalm 121 means a great deal to my wife and me, because some years ago she had cancer in her eye and was in danger of losing her life. The surgeons were battling for her life, and I was wondering what to preach on that Sunday while she was in hospital. The Lord directed me to Psalm 121, and I found that every verse is about eyes. The first line is ‘I will lift up my eyes to the hills.’ When walking up to Jerusalem it is a very dangerous thing not to keep your eyes on your feet, but the psalmist says, ‘I will lift up my eyes to the hills.’ So I preached on that psalm and took a tape recording of it to her in hospital. However, a young nurse, who had only been a Christian for two months, had already beaten me to it. She had visited my wife and had given her a word from the Lord: ‘You will lift up your eyes to the hills.’ A few weeks later we were in Canada and climbing the Rockies together. She has had no trace of cancer since then. The reason Chris at the World Bank had to write was that this Psalm was his mother’s favorite too. Like David Pawson she was born in England, but immigrated to Canada; she was also a writer. Chris related that his mother, like David’s wife, Enid, contracted eye cancer. She lost her eye to the cancer in her twenties, but she lived on to raise a family and write. She survived to the age of ninety-one, passing away just last summer. She clung to Psalm 121 and referred to it often in her writing, using the Rocky Mountains as a backdrop. Here we are in the first week of the new year. 2008 was a rough one. The motto for 2009 seems to be, “may it be better than 2008.” I think it will be. My advice for the New Year? Lift up your eyes to the hills. Know where your help comes from. It comes from the Lord. He who watches over you will not slumber. He will watch over your coming and going, both now and forevermore. It is with great sadness that I just read the honorable bible teacher, David Pawson has advanced prostrate cancer that has now spread to his bones. It is inoperable. This was posted by a trustee in August 2016. In listening to one of his youtube videos he mentioned he had “inoperable cancer” with indifference. I was horrified. I search the web and learned more. All prayers are welcomed and needed. he is a wonderful man. Perhaps a miracle will happen. If not, pray that he is comfortable and surrounded by love. The unfortunate news regarding Mr. Pawson’s prostate cancer was posted on May 30, 2016.Since then David has continued to teach and travel. 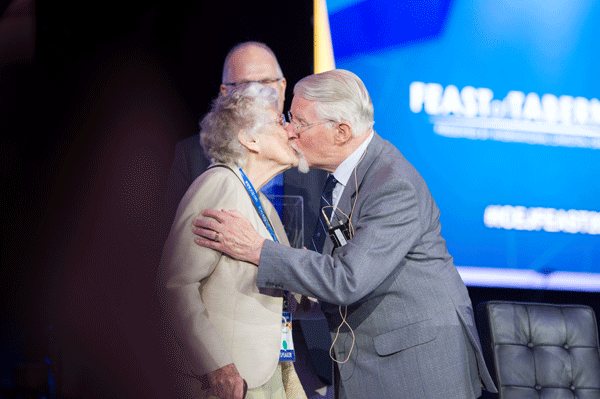 David spoke at the Feast of Tabernacles celebration in Jerusalem in October, where he and wife Enid were honored for their lifetime of service together. As recently as December, David was teaching in Bath,England.